Acquire Real Estate is a small, innovative, full-service and referral-based real estate firm that was founded in 2004 by our current Managing Broker to serve the needs of our clients in Northern Virginia. Our founding broker is retired military (Army), and while we have a broad clientelle, many of our clients today still are relocating military families. 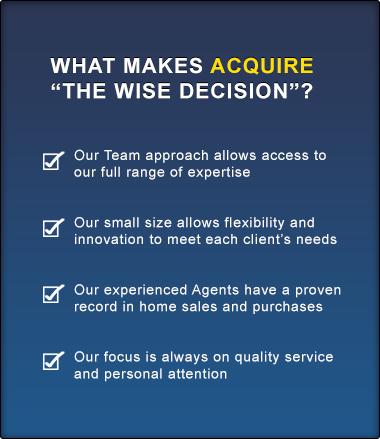 Acquire's mission is to allow personal and ethical service and flexibility in approaching a transaction, and to have talented agents with differing backgrounds and experience allowing us utilize our team's expertise. In an industry that rewards quantity, we have chosen to be different and to make our objective and focus on quality service – we give dedicated and personal attention to every transaction. Our agents are all members of the Northern Virginia Association of Realtors, the Virginia Association of Realtors, and the National Association of Realtors. As REALTORS® we have a personal and professional commitment to ensure sellers and buyers are brought together in arrangements that are fair and equitable. While all REALTORS® are state-issued licensees as agents or brokers, the major difference between a “real estate licensee” and a REALTOR® is that REALTORS® have taken an oath to subscribe to a stringent, enforceable Code of Ethics with Standards of Practice that promote the fair, ethical and honest treatment of all parties in a transaction.